The 7-year-old cancer patient who became an Internet sensation for his touchdown run in Nebraska's spring football game has yet another fan  President Barack Obama. 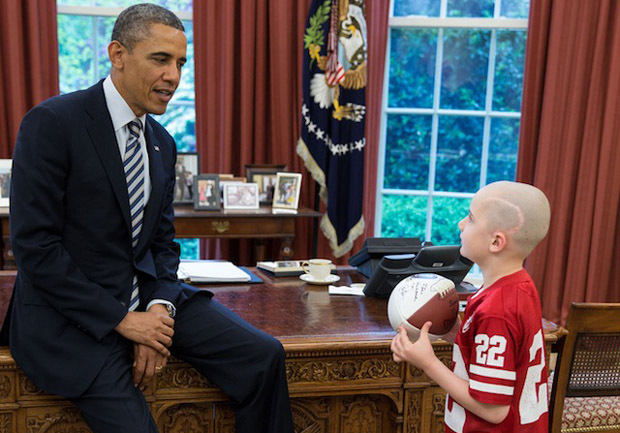 Jack Hoffman, his family and former Cornhuskers running back Rex Burkhead visited Obama for 15 minutes in the Oval Office on Monday. Obama presented Jack with a new football and told him he was proud of him. "I thought it was awesome," Jack said. Burkhead, who was drafted by the Cincinnati Bengals on Saturday, befriended Jack shortly after the boy was diagnosed with brain cancer in 2011. Their friendship led to the "Team Jack" campaign that has raised awareness and funds for research. The trip to Washington came about after Sen. Deb Fischer, R-Neb., mentioned Jack's touchdown run to the president in casual conversation, said Jack's father, Andy Hoffman. Obama told Fischer that he knew about Jack from watching his touchdown run on television and that Jack should visit him at the White House. The Hoffmans, from Atkinson, Neb., arrived in Washington on Saturday, did some sightseeing Sunday and plan to go home Tuesday. Jack met first with Obama, and then he introduced the president to parents Andy and Bri, little sisters Ava and Reese, and Burkhead. Obama spoke briefly to Burkhead about his NFL prospects and thanked him for all he has done for Jack. The Hoffmans, in turned, thanked Obama for meeting with them. "It was just such a great opportunity for us to visit him and raise national awareness for pediatric brain cancer," Andy said. "He talked about his commitment to research and science." Jack has been a familiar face to Huskers fans who have rallied around the "Team Jack" campaign and saw him help lead the team's traditional Tunnel Walk before last September's game against Wisconsin. The rest of the nation got to know Jack from the April 6 spring game, after the coaching staff invited Jack to run a play in the fourth quarter. Wearing a miniature Burkhead uniform, he took a handoff from Taylor Martinez and scooted 69 yards to the end zone. Players on both sidelines poured onto the field, followed him across the goal line and mobbed him, lifting him on their shoulders to the delight of the crowd of 60,000. ESPN and national news networks showed video of Jack's TD run for several days, and it received almost 8 million views on YouTube.